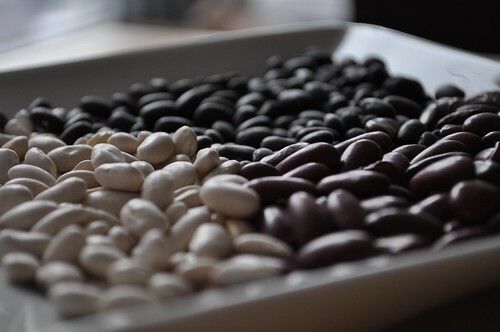 Legumes of all sorts, from black beans to chickpeas to lentils, are packed with nutrients. They’re an excellent plant-based source of protein, which is great for vegetarians and a good substitute/supplement to the diet of meat-eaters. Beans are hearty, rich in iron, low in fat and full of fiber. They come in dozens of interesting shapes, sizes, textures, and flavors (if you haven’t already, check out Rancho Gordo to get an idea). They’re one of the most versatile foods you can find and, yes, they’re gluten-free. You know what else they are? They’re cheap. For those people out there who say they can’t eat good, whole foods because of cost issues, beans blow that argument right out of the water. They’re already cost-effective in the form with which most consumers are familiar (canned), but if you buy them dried it’s almost ridiculous how little you’ll end up paying for such a nutritionally dense food. At my market, a pound of dried beans costs only slightly more than a single can of beans, and I’ve found that that pound will yield about 4 cans worth of cooked beans. Pretty good, right? I know that some of you may see cooking up a batch of dried beans as more effort than it is worth, though, and I’m here to hopefully persuade you otherwise. Not only is it not labor intensive, but beans cooked at home have a far better texture than those from a can. Also, as with so many other things, when you cook them at home you can control other important elements, like salt. Just think about it for a second, what doesn’t taste better when it’s homemade? Now, we don’t generally eat a ton of beans in this country (at least I know I didn’t for most of my life), so you may be thinking, Okay cool—but what am I supposed to do with them? A couple ideas: add them to soups, put them in your chili along with or even instead of meat, on top of rice or other grains, under a runny egg for breakfast, pureed into dips and spreads. The possibilities are endless. I’ve been cooking with dried beans a lot lately and am really loving it. This means I’ve also been writing more recipes that include beans, so hopefully I’ll be able to give you some ideas as well. Going forward, my recipes will list both the canned quantity and the dried equivalent. I’ll always recommend that you go dried, but even I don’t plan ahead sometimes and canned beans are still a great option. 1) Pick through your beans. These are a product of nature and sometimes little bits of stones or other debris get mixed in. I feel confident enough to sort mine by running them through my hands above a colander, but spread them out on a sheet pan if you’re feeling particularly diligent. 2) Rinse your beans. I do this using a colander (which is why I pick through them in one), but a sieve would work as well. a) The Overnight Soak—this is the easiest, most hands-off method. 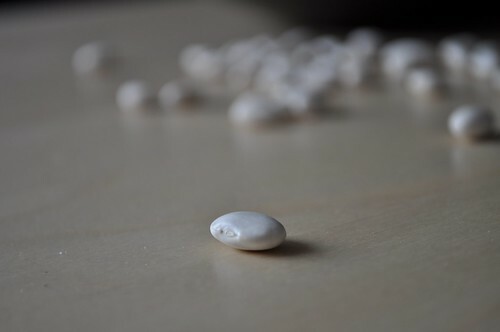 Place your beans in a bowl and cover generously with cold water. They will nearly double in volume while soaking, and you want them to remain fully covered with water the whole time, so keep this in mind when choosing and filling your bowl. Allow beans to soak at least 8 hours, or overnight. b) The Rapid Soak—this is what I often have to resort to because I forget to soak them overnight. Place your beans in a pot that is large enough to accommodate them and add enough water so that they’re covered by a couple inches (again, keeping in mind that they will increase in volume). Place the pot on the stove and bring the beans to a rapid boil. Allow to boil, uncovered, for 2 minutes. Remove the pot from the heat, cover, and let stand for one hour. Voila, your beans are soaked. 4) Drain and rinse your beans. Make sure to rinse the beans with water that is at a similar temperature to the water that the beans are currently in. 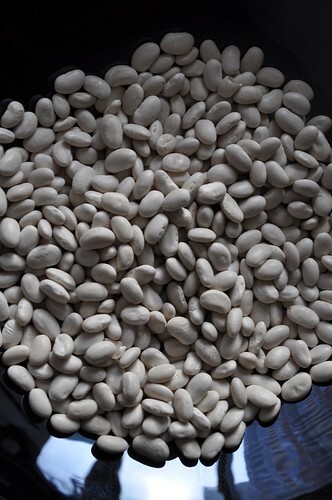 A temperature shock, particularly warm beans under cold water, will cause the skins to peel back. 5) Cook your beans. You will find recipes that call for the beans as they are right now, soaked. If that is the case, your beans are ready and you can go ahead and follow the recipe. For regular eating or when following other recipes, including those that call for canned beans, you must first cook the beans completely. Cooking times will vary depending upon the variety of bean that you are cooking as well as the freshness of the beans (older beans can take longer to cook). Place the soaked beans in a pot and cover generously with water. Feel free to add salt if desired (I personally don’t find it necessary). You may also want to add a bay leaf or a piece of kombu seaweed. These are said to help in reducing the gassy effects of beans—I find a bay leaf is sufficient and I think it adds a nice depth of flavor. Bring the beans up to a rapid boil. Allow to boil, uncovered, for 5 minutes. Skim off any foam that has accumulated on top (this will also help to cut down on gassiness), cover, and simmer over low heat until the beans are done. The best way to tell if your beans are done is by giving them a bite. I like to test them at 30 minute intervals, determining how much longer I think they need by how done they are. If they’re still inedibly hard, give them another 30 before testing again. If they’re slightly crunchy but mostly done, give them another 10-15 and retest. Below I’ve written some general cooking times that have worked for me when cooking the varieties that I use most often (I will update this list in the future), but again, times may vary depending on your beans. 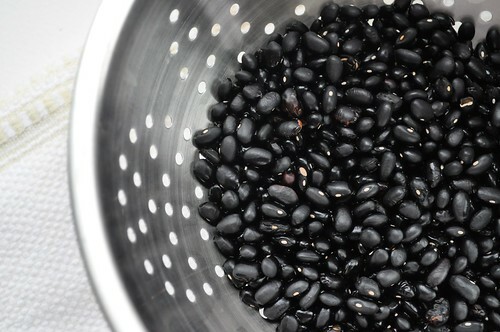 Once your beans are cooked, drain and rinse them once more. Remember to still be mindful of the temperature of the water used to rinse them. Your beans are now ready to use however you so choose. 1) Divide the beans between pint (or quart) jars; figure 1 pint jar per every ¼ pound of dried beans (one pint of cooked beans equals one store-bought can). Top the jars off with water and store the beans in the fridge for up to a week. Drain and rinse before using. 2) After draining and rinsing your cooked beans, portion them out into several plastic food storage bags. Remove as much air from the bag as you can, seal, and store in the freezer for several months. 3) Pressure canning is also an option for storing beans. I personally do not own a pressure canner, but if you do, consult a reputable source such as the Ball Complete Book of Home Preserving for instructions on how to safely pressure can your beans for longer-term storage. Okay, I know that all that text may make cooking with dried beans seem like a lot of work, but I promise it’s not. I’m incurably verbose, and most of the prep time is idle prep time, which means you can be doing other things while your beans are soaking or simmering away on the stove. After you’ve done it once, it’s a cinch to do again. And if you decide to cook up a pound or two on a lazy Sunday, you have a number of ways to store them until you’re ready to use them. Make beans a part of your diet. They’re healthy, cost-effective, and the more you eat them, the more you’ll come to love them—this is a good thing since, as we all know, “Beans, beans, they’re good for your heart.” Sorry, I couldn’t resist. This is a great post. Although I've always been a big bean eater (I eat vegetarian probably 90% of the time), I never really know how to cook my own beans and have them come out right. I tend to just get canned beans. But it's definitely a lot cheaper (and there's less sodium) to soak my own. I've become a big bean-eater myself in the past year or two (now eating veg most of the time as well)–starting with dried definitely makes a difference. Glad you found this helpful!